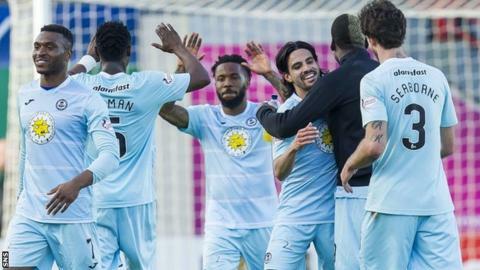 It was hoped the plucky Australian in him would prompt some sort of outrageously self-assured statement that Partick Thistle will definitely secure a top six Premiership spot. But no, Ryan Edwards - Alan Archibald's prize pupil against Hamilton on Saturday - answered in a far more measured, British style. "We're trying to be positive and that would be great," Edwards told BBC Scotland. "But we've got three games before the split and we're going to look at them as three cup finals. Hopefully results go our way and we'll see what happens towards the end of the season." Thistle haven't been in a major cup final since 1971, so Jags fans will probably welcome Edwards comparing upcoming league games to occasions of that ilk. Home to Kilmarnock. Home to Dundee United. Away to Ross County. Those are the tests that stand between Partick Thistle grabbing their first top half finish since Archibald brought them into the top tier in 2013. The Firhill club are three points behind sixth-placed Ross County largely thanks to Edwards' whirlwind afternoon against Hamilton Accies. Named as a substitute but called upon minutes before kick-off to stand in for Liam Lindsay, who injured his hamstring in the warm-up. By 4:45pm Edwards was the match-winner. "Yes it's a bit strange. It all happened really quickly," he explained. "It happened to me against Hearts when Stuart Bannigan got injured and I came on in the 43rd minute. You've got no time to warm up and you get thrown in straight away. "Being named on the bench, I'm just prepared as possible and ready for any opportunity because these things happen in football. "Thankfully we got the three points and hopefully I made an impact." There are few doubts about that. And the 22-year-old former Reading midfielder reached an interesting career milestone in the process. "It was my first professional goal so it was an incredible feeling and for it to be the winner was even better," said Edwards. "It was a great ball in from Kris Doolan. It's something I've been working on in training; breaking into the box from the number 10 position to score some goals. I think that needed added to my game and thankfully it worked." Edwards short time at Firhill also seems to be working out reasonably and he's optimistic about staying in Scotland beyond the expiration of his contract in the summer. So how have his team-mates received him? "They make fun of my accent a bit but I think that's good," he smiled. "Scottish people are really nice and all the lads and staff have been great to me." Edwards certainly knows how to say the right things.